To thrive is to push beyond survival and into a life where a person can be happy, healthy, and productive. To thrive, NRV residents need reliable access to nutritious, affordable food and the knowledge to make the best nutritional choices for themselves and their families. This means economic as well as educational development, building capacity from farms to food pantries, and uniting our prosperous and burgeoning local food network with the people who can benefit from it the most. 10% of New River Valley families and one in five children in the NRV experience hunger or food hardship. People diagnosed with diabetes have medical expenditures that are approximately 2.3 times higher than expenditures would be in the absence of diabetes. Approximately 1 in 10 NRV public health care expenditures are attributed to diabetes, resulting in public costs anywhere from $255-$528 per resident annually. 6% of NRV residents lack access to a vehicle and half of NRV residents live more than 2 miles from a grocery store, both of which can limit access to nutritious food. Access to affordable, locally-sourced foods is growing in the region, but the majority of NRV residents still cannot access or afford local foods. Foundations and philanthropists are positioned to do what others cannot – identify needs, take reasoned risks, pilot innovations, and give financial support. 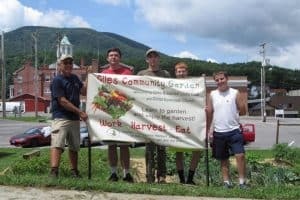 The Community Foundation of the New River Valley is making a long-term commitment to work at the nexus of hunger and health. We will build on the programs already succeeding in the region and help to develop and strengthen collaborations. Our goal is to connect all NRV families with nutritious and affordable food options that have a positive impact on long-term health. Develop a comprehensive understanding of hunger and nutrition related organizations, programs and services in our region. Reduce the number of organizations working in isolation and establish a food poverty and health network building on good practice. Build long-term community capacity to address hunger and poverty, and to strengthen the local food system. Expand funding for projects that will increase food access, improve food distribution, ensure the stability of the food supply, and teach healthy eating habits. Gather data and evidence to measure progress and to attract further investment.